The workshop was aimed at updating the knowledge base and application orientation in Intervention researches in social work practice. The sessions were lead by Dr. D.K. Lal Das, Director, R. M. College of Social Work and Research Centre, Hyderabad, Dr. Tony Sam George, HOD, Dept. of Psychology, and Dr. Bino Thomas, Coordinator, Dept. of Social Work, Christ University, Bangalore. 33 participants including, practitioners, academicians, and scholars from various universities and schools of social work participated in the workshop. Interactive lectures, discussions, group activities, presentations were the methodology applied by the resource persons. Workshop started at 9.15 am on the first day with an informal opening note by Dr. Bino Thomas, Coordinator, Dept. of social work and self introduction of the participants, followed by message from the Dean, Prof. John Joseph Kennedy. First technical session was on “Introduction to Intervention research in social work” by Dr. Tony Sam George, HOD, Dept. of Psychology, Christ University, Bangalore; on second day, he covered “Principles of interpreting data” and “Researchers abilities in intervention researches”. The topics covered by Dr. Lal Das on first day were, “Designs in Intervention Researches”, “Steps in Intervention Research, modalities of intervention research”. Second day, he had an informal discussion with participants on their research study methodology, followed by a session on measurements, statistical tools and data analysis. He could deliver an interactive lecture on “Research Publications” to our III Sem MSW students on the same day. The second day started with a recap of the first day session by a participant Mr. Simon Joseph. Dr. Bino Thomas, handled the first two sessions of the second day. The topics covered were, “Principles of program development”. The workshop ended at 4.15 pm. Conclusion session started with evaluation of the workshop by participants. They acknowledged the resourcefulness of the workshop content and its applicability in social work research. The participant’s feedback reflected that, the workshop could sensitize, enhance the knowledge of the Social Work educators, researchers and practitioners on intervention research designs. All participants left a positive comment to the organizing committee. Dr. Sheeja Karalam, Associate Professor, Dept. of Social Work made the conclusion remark and vote of thanks at the end of the session. Certificates were distributed. Department of Botany organized a special guest lecture program on the Topic “Blue Green Algae” delivered by an Algologist Dr.Veeresh (Department of Botany, Chowgule College, Margao, Goa) on 16th July at 2 PM, in Room no 911, Central Block Ms Namratha of the 3 year B.Sc, was Mastering the function. Prof. George Thomas welcomed the guest and the gathering. The lecture covered various aspects of the blue green algae, Starting from the occurrence, distribution, types, morphological variations, growth pattern, reproduction, the economic importance and usage as food by human beings. Students attended the program with enthusiasm and discipline. The students asked a lot of doubts on this topic. As a part of the entertainment, Ms. Hanna Kim and Ms.Niehenuo of the 3 year B.Sc., sang a wonderful English song. The lecture concluded by a vote of Thanks by Prof. M. Xavier Vincent. The program was attended by Dr. Louis George, Associate Dean of Science, Prof. Arul Chellasamy from Department of Zoology, All the members of the Department of Botany and Students of I BCB, CBZ, 3 BCB, CBZ, 5 BCB & 5 CBZ. The department of languages organized a Multilingual Student poets meet on Friday the 16th July 2012. The programme was organized in the Mini Auditorium between 3.00 to 4.00 pm. Students from various languages like Sanskrit, French, Kannada, Hindi, Urdu, English and Tamil recited their poems. Love, Patriotism, Ecology, Social problems were the issues focused in their poems. The style and the quality of the poems presented by the students were appreciated by the audience. Chief Guest Prof. Nanjegowda, Dean of sciences appreciated the programme and congratulated the language department and suggested to continue with the tradition. Department of Management Studies conducted a Session on the "Current Global Economy and Emerging Trends"
Session on “Current Global Economy and Emerging Trends” on 13th July 2012, Friday 2pm to 4pm, Department of Management Studies conducted a session on the current global economy and emerging trends. This session would not have been possible without the guidance of Dr. Jain Mathew and Prof. Mahesh Haridas. This session was conducted for finance students of BBM(Bachelors of Business Management) and BBA(Bachelors of Business Administration). Even USAC Exchange program students took part in this session. Totally around 180 students were part of this interactive session. This interaction session was conducted mainly for at providing all round information about global affairs to the students. Today what we learn about global issues is through media and the perceptions we have will not be as same as that of the citizens of the particular country. Eg. About any issues in America we learn from news papers and media on any topic is not understood in the way an actual citizen of America understands. So in order to increase our intellectual horizon in terms of global issues and to have a clear cut idea about it, this interaction session was conducted where speakers from different parts of the world talking about the economic issues, political issues, social issues and relationship with other main countries with their country. The speakers from different countries, currently studying in Christ University as exchange program students of USAC, represented their own country talking about its past and current economic issues, political issue, relationship of their country with other countries etc. Selected Students of Christ University Management Studies, Represented India. These students have a strong background. Every topic was discussed deeply and there was a comparison interaction between many countries where we learnt a lot of difference in various countries. The panel discussion resulted in broadening the intellectual horizon in terms of understanding different economy, different views and perception on same topics, different suggestion on future aspects of different economy. This session was a great learning experience for all the students present in the session. It was more of an interaction session. Everyone were allowed to participated which is one of the reasons for its success. This session gave students and speakers a lot of knowledge on the economy of different countries in relationship with their country. Students Participated very actively in terms of putting forward their views and perception on the topics. Students were so curious and involved in asking questions to the representative, which made the session more vibrant and an effective learning event. More of these sessions can provide students a practical knowledge and a great exposure on current global issues related to their field of interest. It was held on June 29th at Room No.C105. It was held between 3 - 5pm. Chief guest Dr. Satinder Duggal, Associate Dean, Deanery of Commerce and Management addressed the audience. The Keynote address was delivered by Prof. T. S. Ramachandran, CUIM. Prof. Suresha B Academic Coordinator, and Prof. Mahesh Haridas, CUMA Coordinator also address the gathering. The programme witnessed the Inauguration of Finance Club - Arthavikas and Investors Information Cell and release of Finometrics June edition. IBM Work Shop on "Business Analytic"
Department of Management Studies 28th June 2012, Christ University. On June 28th IBM work shop on "Business Analytic" was held at Room NO.C301 and the Resource person: Mr.Aditya from IBM. It was held between 2-5pm. on 2nd July, 2012, Christ University. The inauguration and investiture ceremony of the Psychology Association was held on 2nd July, 2012 in the main auditorium, Christ University between 3 and 4 pm. The chief guest for the event was Dr. Nitin Shukla, a faculty member of Cadabams, Bangalore. The ceremony was also presided over by the Dean of Humanities and Social Sciences, Prof. Mallika Krishnaswamy, the H.O.D. of the Psychology department, Dr. Tony Sam George and the academic coordinator, Dr. Padma Kumari. The event started off with the lighting of the lamp and invocation song following which there was the welcome address by the HOD who welcomed the chief guest, the dean, the faculty and the student body and spoke of the importance of having an association to inculcate an interest in the field of psychology given it’s growing importance in today’s world. This was followed by the investiture ceremony during which the association members including the office bearers and the class representatives were appointed to their posts with badges by the HOD and the academic coordinator. Once, the office bearers were officially announced, the presidents of both the UG and PG department addressed the gathering. In the address, they introduced everyone to the Psychology Association, the annual fest ‘Silhouette’ and gave a brief idea as to what activities are conducted and encouraged the students to participate wholeheartedly in the activities conducted during the academic year. The secretaries of the UG and PG department went on to give a detailed description of the activities and competitions that would be conducted for both departments over the two semesters. The dean, Prof. Mallika Krishnaswamy, spoke to the audience about the importance of student participation and motivated the students and teachers alike. Dr. Nitin Shukla, a specialist in hypnotherapy, spoke to the student gathering about the importance of bringing together the psyche and psychology and the necessity for understanding the psyche in order to succeed in the field of psychology as we know it today. The day also saw the presentation of certificates for the graduates of the diploma in Life Skills and Reproductive Health’. It was heartening to know that these students used their learning from the course to teach and help other students and adults alike both within and outside the country. The programme ended with the joint secretary of the UG department thanking the dignitaries and the audience for their support and encouragement. All in all, the ceremony promised a bright start to the year ahead. 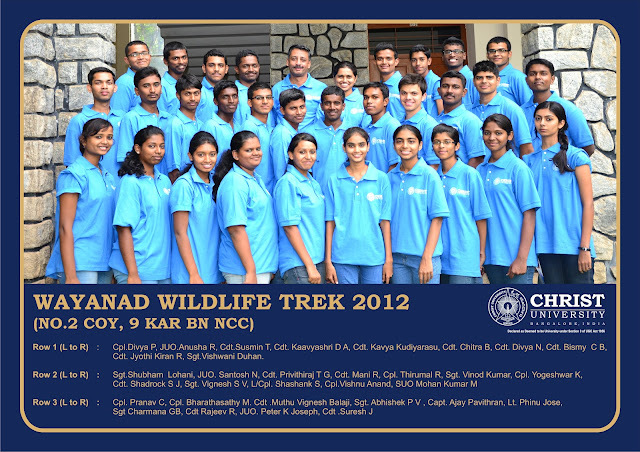 The Cadets of Christ University undertook a trek at the Muthanga Wildlife, Waynad Dist, Kerala. The Trek was from 16th - 26th May 2012. The Cadets trekked 112kms range through the wild reserve forest with the help of forest guards. The Team of trekkers were lead by Capt. Ajay Pavithran and Lt. Phinu Jose of Christ University.